As companies transition from a customer-centric vision and embark on their own omnichannel transformation, there are key operating model considerations and technology enablers that allow companies to unlock capabilities to deliver maximum benefit. Omnichannel is neither a technology solution nor a means to an end. Rather, it is a transformational way of doing business that connects disparate processes and technologies around an integrated, customer-centric operating model. It also provides the means to meet consumer demand in the “right now economy” by empowering consumers to do business on their terms: anyplace, anywhere, anytime. As a result of this fundamental shift, companies must look to engage consumers on their turf and time, recognizing that their tastes and expectations are dynamic. As consumer touchpoints have become more integrated, real-time, and personal, channels have become blended and interactions are ever-present. As a result, decreasing the time and space between a company’s value (product or service) and the consumer’s demand is proving to be a key differentiator when competing in crowded categories. For companies that made the investment to transform their operating model and technology ecosystem in a way that is more customer-centric, the benefits of an omnichannel experience are well researched: improved net promoter scorers, increased touchpoints, opportunities for up sale or cross-sale, improved marketing ROI, operational efficiency, etc. In a Harvard Business Review article from 2017, researchers determined that 73% of shoppers used multiple channels during their shopping journey and that those multi-channel customers were more valuable than single-channel customers. Said differently, the benefits of omnichannel are tangible and material. Many executives have considered an omnichannel vision but are not sure how to get there within a reasonable timeline and budget. In this three-part series, Becoming Customer-Centric, we share a how-to guide for executives to (1) get started, (2) architect a winning solution in complex enterprise environments, and (3) manage change of people, operations, and technology in a transformed customer-centric operating model. For many companies, the decision whether to invest in an omnichannel transformation is often a defensive reaction to a changing set of consumer expectations that were re-baselined by the digital age. For example, as retail companies raced to service customers online in order to compete with the likes of Amazon, results were often disjointed experiences between online and in-store channels. In contrast, without the handcuffs of tightly-coupled legacy order management and point-of-sale systems, e-commerce pure-plays are able to maintain a single view of the customer, which enables them to deliver delightful user experiences while being operationally efficient. It should, therefore, not come as a surprise that executives have prioritized harmonizing consumer channels to drive differentiated value. As companies transition from a customer-centric vision and embark on their own omnichannel transformation, they need to understand that there are operating model considerations and technology enablers that will assist them in unlocking capabilities and delivering maximum benefit. Architecting the omnichannel experience requires sewing together traditionally disparate functions in a new operating model and knitting together enterprise technology solutions so that experiences, transactions, and value are shared real-time across the ecosystem with all parties engaged in the customer journey. Enabling seamless cross-channel interactions, personalized experiences, targeted promotions, and improved shopping journeys require leveraging data collected in disparate systems and various data stores. Promoting real-time data freshness and transparency is now a baseline consumer expectation and opportunity for additional revenue streams. In practice, the implementation of an omnichannel strategy without the appropriate foundational process, data, and architecture pre-work can quickly balloon in complexity and lead to costly overruns or negatively impacted return on investment. Lessons learned from past transformations provide an excellent precedent and reference for how to successfully build a competitive, digitally-enabled customer-centric business in the “right now economy.” Successful programs focus on delivering business value instead of selling the need for a new platform and are rooted in an experienced approach that mitigates common pitfalls. Too much emphasis is often placed on a perceived make-or-break software selection process instead of talking with customers, investing in UX expertise, and defining, in detail, a set of future-state capabilities that support the strategy. In part 2 of our series, we explore the key people, process and technology building blocks to enable the benefits of an omnichannel transformation. 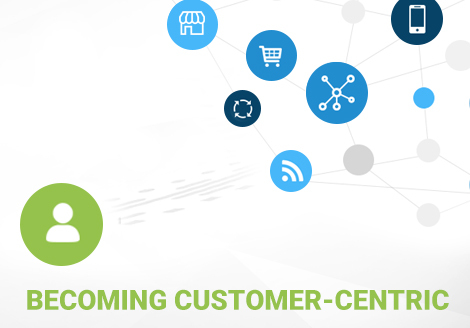 Have questions about an Omnichannel transformation for you business? We're always here to help.